Carli Lloyd scored from the penalty spot and Kelly O’Hara added a late goal as the US defeated Germany 2-0 to advance to the final of the Women’s World Cup. Germany’s Celia Šašić missed a penalty kick before Lloyd converted from the spot on her attempt nine minutes later. Substitute O’Hara finished a good move involving Abby Wambach, Meghan Klingenberg, and Lloyd to put the game to bed in the 85th minute. It was the midfielder’s first international goal. Jill Ellis changed formations to play 4-3-3 after using a 4-4-2 for the first four games of the tournament. Megan Rapinoe and Lauren Holiday both returned to the side following yellow card accumulation suspensions, dropping O’Hara and Amy Rodriguez to the bench. Tobin Heath and Morgan Brian retained their spots, with Heath pushed wide as the left sided player of the front three and Brian continuing in a defensive midfield role. The Germans looked to press the US high to start the match, but the Americans were up to the task, passing in tight triangles and moving the ball quickly. The US got two early chances to take the lead, only to be denied by the fantastic saves of German goalkeeper Nadine Angerer. Julie Johnston flicked a Megan Rapinoe corner kick on goal at the near post, but Angerer was down quickly to parry the shot. Alex Morgan forced an even better save out of Angerer in the 14th minute, getting in on the keeper one on one after a clever pass from Heath. But again the German backstop was able to close the angle and stifle the striker’s shot from 14 yards out. Morgan Brian and Alexandra Popp smashed heads midway through the half as both players challenged for a ball at the US back post. They remained on the ground as trainers tended to Popp’s bloodied head. Despite looking dazed, both were able to continue after the short delay. The US continued to press the Germans as the opening forty-five minutes wound down, with Johnston, Morgan, and Heath all getting half chances off of the six American first half corner kicks. Morgan broke into the box to create the final opportunity of the first half in the 44th minute. However, the striker’s tough angled shot from the left side was wide of Angerer’s goal. The Germans looked improved to start the second half and began to probe the US defense with more purpose than in the opening period. Germany was rewarded for their pressure in the 59th minute when Julie Johnston was adjudged to have pulled back Popp as the German broke for goal. The bouncing ball had eluded Johnston and allowed Popp in alone, leaving Johnston with little choice but to give away the penalty. As Šašić prepared to take the spot kick, Hope Solo took a short walk away from the US goal in hopes of psyching out her out. The tactic worked as Šašić pulled her low shot wide left with Solo diving the other way. But the Americans would be awarded a penalty of their own shortly thereafter. A powerful run into the box from Alex Morgan saw her push the ball past the German backline, only to be bodied to the turf by Annike Kahn on the edge of the 18 yard box. It appeared that the foul may have been on the line or even outside the box, but a penalty was awarded. Carli Lloyd stepped up to take the spot kick, as she did against Colombia in the quarterfinals. And just as she did two games ago, the Delran native finished confidently, putting a shot to the right of Angerer as the German moved the wrong way. O’Hara was introduced in the 75th minute and Abby Wambach in the 79th as the US looked to hold the lead. Both substitutes combined to do more than that, with the US adding a late insurance goal. Wambach did well to track down a misplaced throughball into the left channel behind the German defense. She held up play, waited for help, and pulled a pass back to Meghan Klingenberg near the edge of the penalty area. Klingenberg smartly feinted and slid a pass into Lloyd, sneaking between German defenders twelve yards out and to the left of the goal. The midfielder beat her defender with a hesitation move and drove toward the endline, pushing a cross waist-height into the goal mouth. O’Hara’s perfectly timed run saw her leg shoot out in front of her defender, smashing the ball home from five yards out. 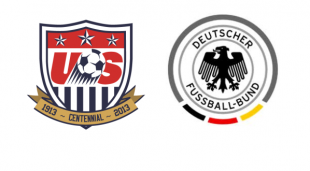 The Germans could not mount a comeback as they threw numbers forward, and the US held on for the clean sheet. The Americans have not let up a goal since the first half of their opening match against Australia, a span of 513 minutes. The US will take on the winner of tomorrow’s Japan-England match on Sunday in Vancouver (7 pm: Fox, Telemundo, Fox Soccer 2Go, NBC Deportes En Vivo). After the first four matches of the tournament, I was not expecting the Americans to put in the dominant performance they did today against the top ranked team in the world. But they did. Ellis’ 4-3-3 stifled the German attack, who were forced to play the ball on the wings for large stretches of time. Better yet, the formation allowed the US attack to keep the Germans pinned in their own end and on the back foot. The backline of Meghan Klingenberg, Becky Sauerbrunn, Julie Johnston, and Ali Krieger has been the best in the tournament and showed no signs of letting up. Combining that with the goalkeeping from Solo and the midfield work of Lauren Holiday and, in particular, Morgan Brian, and the US defense will remain a tough nut to crack in the final. There’s a saying that goes that good teams/players create their own luck. The Americans certainly had luck on their side tonight. When Johnston pulled down Alexandra Popp, she could (and probably should),have seen a red card for the denial of a clear goal-scoring opportunity. Instead, the stalwart defender only saw yellow. And not only that, Celia Šašić, one of the best strikers in the world, missed the ensuing penalty kick. Lucky, indeed. When Alex Morgan broke into the German box to earn the US penalty ten minutes later, the foul by Krahn was just on the line of the area and could have easily been given as a free kick instead of penalty. Instead, Lloyd opened the scoring from the spot. Defying growing calls for a changed formation (and basic logic), Ellis rolled out the same inconsistent 4-4-2 for the first four games of the tournament. And all four times the US looked stuttering and vulnerable. Against a much stronger opponent in Germany, the change to 4-3-3 made all the difference. Megan Rapinoe was more influential and able to run one on one versus her defender. Tobin Heath on the right side was able to play in a more advanced role and attack with pace down her wing. Carli Lloyd played her best game of the tournament, not only scoring the first and setting up the second goal, but also covering a ton of ground in the center of the park both on and off the ball. Lauren Holiday and Morgan Brian proved a strong combination in the defensive midfield, with a particular nod to the 22 year old Brian, who hardly misplayed a pass all night despite a heavy collision in the first half. With the US up a goal and looking to close out the match, the insertion of Kelly O’Hara for Tobin Heath could have been seen a defensive move. But instead, the midfielder rewarded her coach by scoring her first goal for the national team to seal the win. Author: Mike Servedio Mike contributes to game day coverage of the Union and also covers the US Women's National Team. He misses the Philadelphia Independence. Follow him on Twitter at @MikeServedio. Well done ladies. You earned that one. Get it done on Sunday. Well despite Germany appearing a step slow… I stand corrected. Well done ladies. Well done. Best they have played in a while. I was critical of Ellis for some of her coaching decisions earlier in this tournament, but she deserves credit for making the right lineup choices the last two games. Hope the winning continues on Sunday. Go USA! Man that was really fun to watch! Sure they got lucky w/ the PK that shouldn’t have been and the no-red on Johnston, but it’s not like Germany didn’t benefit from questionable refereeing. In the last 10-15 minutes or so of the of the first half, Germany were getting away with all kinds of crap – Maier probably should have received a second yellow when she clattered into Rapinoe’s back, not playing the ball, and Popp definitely should have been booked for a very late tackle just before that. Our ladies created more chances, attacked with purpose, were rock solid defensively and overall great value for the win. Let’s bring home the cup!